The Entertainment Press Society (Enpress, Inc) announces the finalists to the 11th Golden Screen Awards to be held on October 4 (Saturday) at Teatrino at the Promenade, Greenhills, San Juan City. From close to a hundred films shown last year, Golden Screen Awards came up with a short list of 40 films that was reviewed by the voting members for almost two months. In a resolution presented by Awards Chairman Lito Mañago, it was agreed upon by the voting members to limit the number of nominees to five per category or even less depending on the rating garnered by the film, actor or technical staff. Hannah Espia’s debut film Transit, which was the Philippines’ official entry as Best Foreign Language Film at the Academy Awards, got the most number of nominations with 12, including Best Motion Picture- Drama and Best Director. This was followed by the drama of a nanny in Ano ang Kulay ng mga Nakalimutang Pangarap starring Rustica Carpio and directed by Jose Javier Reyes with 11 nominations. Also getting 11 nominations is the gripping action flick OTJ (On The Job) which was shown in Cannes and was directed by Erik Matti. It garnered nods for Best Picture and Best Direction. Sonata, the comeback film of Peque Gallaga and Lore Reyes as a tandem, garnered 10 nominations, including Best Actress for Cherie for her role as a diva coping with the loss of her voice and who found solace in the company of a young boy. 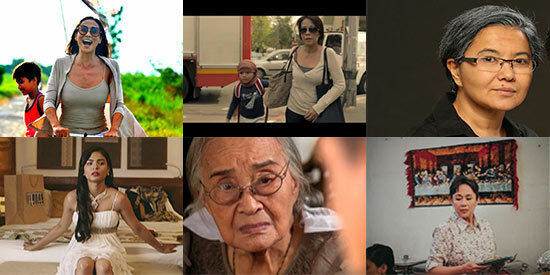 Ekstra, the first Cinemalaya film entry of Star For All Seasons and Batangas Governor Vilma Santos is nominated in 7 categories, including Best Actress for Vilma and Best Direction for Jeffrey Jeturian. Enpress and the Golden Screen Awards would like to thank Ahwel Paz for allowing the use of Dong Juan (located at 72 Mother Ignacia St, Quezon City) as the venue for the nominations and final voting of winners held last Sunday, September 14.